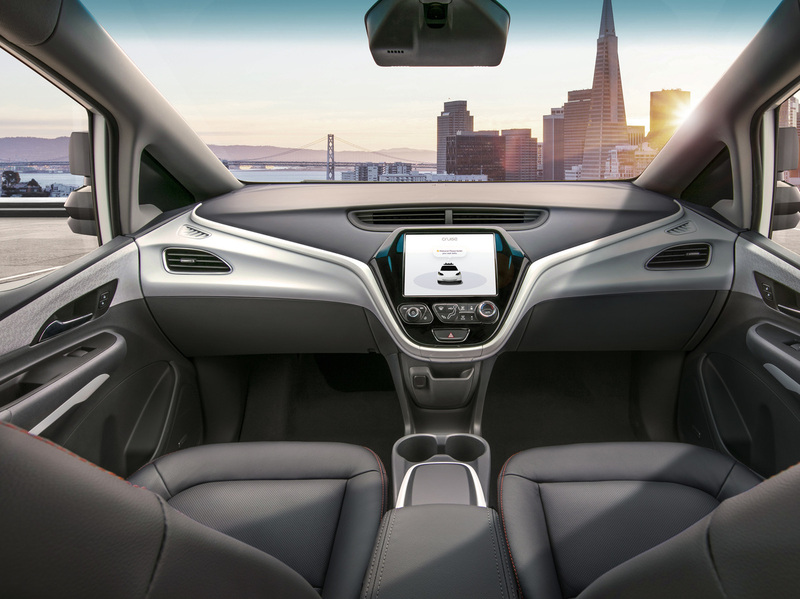 GM Says Car With No Steering Wheel Or Pedals Ready For Streets In 2019 : The Two-Way The car company said Friday that it has filed a petition with the Department of Transportation to deploy its fourth-generation Cruise AV. GM says the vehicle has no manual controls. The Cruise AV is designed to operate on its own, with no driver, steering wheel, pedals or other manual controls. The car company said Friday that it has filed a petition with the Department of Transportation for the fourth-generation Cruise AV to hit the streets in 2019. GM maintains that the car "will comply with federal safety laws;" the petition is asking for a waiver for laws that it cannot meet "because they are human-driver-based-requirements." For example: "A car without a steering wheel can't have a steering wheel airbag," as GM President Dan Ammann told The Verge. With no steering wheel or pedals, the car's dashboard appears jarringly symmetrical in model photos released by the company. The vehicle maintains the conventional design of two rows of forward-facing seats. Some critics, such as Jalopnik's Jason Torchinsky, have suggested GM should have been more experimental: "There's just no reason to keep these rigid interior design rules when you're not required (or able) to drive! ... There should at least be an option to swivel the front seats around, or allow the seats to all face inwardly." It'll be possible for humans to stop the car – GM says customers having an emergency "may end the ride by making a stop request, and the vehicle will pull to the side of the road at the next available safe place." The cars are undergoing testing on the roads of San Francisco and the Phoenix suburbs. GM says San Francisco provides rigorous challenges to the vehicles – for example, in the Northern California city it faces more than 7 times more emergency vehicles than in Phoenix. "Mercedes-Benz will make an electric or hybrid version of all its cars by 2022, and they're not alone. Volvo will go all electric by next year. Ford has plans for an electric F-150 truck and an electric Mustang. GM will launch 10 electric or hybrid cars in the country by 2020. And [Mercedes Benz' Christoph] von Hugo says the coolness of self-driving cars will help convince the public that the coming EVs will be worthwhile." Waymo, a company that used to be part of Google, has also "made a limited number of autonomous vehicles without steering wheels and pedals," according to The Associated Press. That company has started a program for people to ride in self-driving cars in parts of Phoenix.